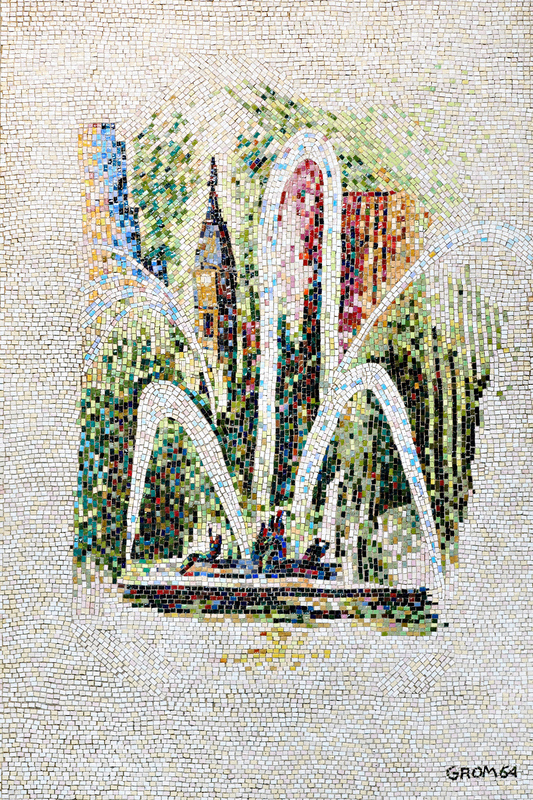 The four (4) Philadelphia-themed tile mosaics, now located in the Broad Street Atrium at the Pennsylvania Convention Center, were originally designed by Italian artist, Bogdan Grom in 1964. The mosaics hung in the elevators of the Architect’s Building located at 17th and Sansom Streets in Philadelphia. During the renovation of the Architect’s Building in 2009 for the opening of Hotel Palomar, construction managers de-installed the mosaics from the elevators to preserve their artistic integrity. Kimpton Hotels, owners of Hotel Palomar, generously donated these tile mosaics to the Pennsylvania Convention Center for many to enjoy for years to come. Each mosaic depicts a well-known sight in Philadelphia: Elfreth’s Alley; the Swan Fountain at Logan Circle; the Benjamin Franklin Bridge; and City Hall with its beautiful skyline. Each of the four (4) mosaic panels is made with multi-colored “Smalti” glass tile imported from Italy and set in cement mortar with plain bronze frames. Each mosaic measures more than seven feet tall and is approximately five feet wide. The mosaic’s unveiling and dedication ceremony, with original artist Bogdan Grom present (age 94 at the time), occurred on May 21, 2013.